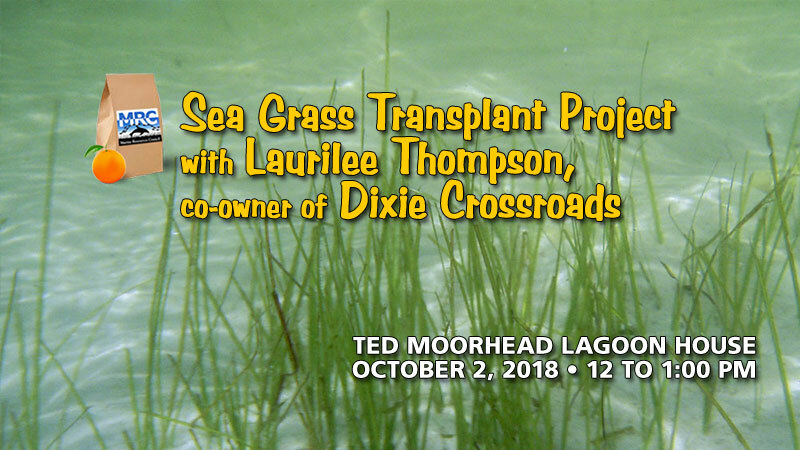 Join us for our October Brown Bag presentation with Laurilee Thompson, co-owner of Dixie Crossroads and creator of a recent seagrass nursery pilot project. Existing sea grass was harvested near the Merritt Island Airport. The seagrass was then grown in a nursery and transplanted at a one-acre seagrass island in the Indian River Lagoon. Scientists monitoring the sea grass confirmed that more than one-half of the island was still covered by seagrass since the transplant in September 2016. This is the first known successful seagrass transplant project of its kind. Click here to see the WESH article and video on this project. Growing up on the water in Titusville, Laurilee Thompson is a local fisherman and co-owner of Dixie Crossroads restaurant. Laurilee remembers the once extraordinary natural beauty of the Indian River Lagoon. She is a conservationist at heart and a strong advocate for the Indian River Lagoon. This event is free and open to the public, all attendees have to do is register online. If interested and able, we ask participants to donate $5 toward our guest speaker series. This educational series is a long-standing and cherished program of the MRC that is supported by volunteers and the community’s charitable giving. All donations are tax-deductible. Attendees are encouraged and welcome to bring and enjoy their lunch during the seminar! For more information on the Marine Resources Council, please visit www.SaveTheIRl.org.